Black Rhino walking to a water hole, Etosha National Park, Namibia. Credit: Ben McRae / Alamy Stock Photo. Limiting global warming to 1.5C above pre-industrial levels rather than 2C could halve the number of vertebrate and plant species facing severe range loss by the end of the century, a study finds. The analysis of more than 115,000 species finds that keeping warming at 1.5C – which is the aspirational target of the Paris Agreement – instead of 2C could also cut the number of insects facing severe range loss by two-thirds. However, if countries fail to ramp up their efforts to address climate change, around a quarter of all vertebrates (animals with a spine), half of insects and 44% of plants could face severe range loss, the lead author tells Carbon Brief. The greatest range losses are expected to occur in some of the world’s biodiversity hotspots, the author adds, including in the Amazon and southern Africa. Although the findings are significant, the research does not explore all the factors relevant to species survival, including the impact of evolution, another scientist tells Carbon Brief. Climate change threatens wildlife in a host of ways. One way is by reducing a species’ geographical range – the extent of the area where it is able to survive. This can occur when local temperatures become too hot for species to tolerate or when changing rainfall patterns affect the types of food available, for example. As a species’ range contracts, its risk of extinction can increase. The new study, published in Science, uses a set of global climate models to explore how warming this century could affect the ranges of more than 115,000 species that live on land. RCP8.5: The RCPs (Representative Concentration Pathways) are scenarios of future concentrations of greenhouse gases and other forcings. RCP8.5 is a scenario of “comparatively high greenhouse gas emissions“ brought about by rapid population growth, high energy demand, fossil fuel dominance and an absence of climate change policies. This “business as usual” scenario is the highest of the four RCPs and sees atmospheric CO2 rise to around 935ppm by 2100, equivalent to 1,370ppm once other forcings are included (in CO2e). The likely range of global temperatures by 2100 for RCP8.5 is 4.0-6.1C above pre-industrial levels. For the analysis, the researchers used four scenarios, including where warming is limited to, in order, 1.5C, 2C, 3.2C (which is the amount of warming anticipated if countries stick to their national pledges to cut emissions) and to 4.5C, the amount of warming expected under a “business as usual” scenario (“RCP8.5”). The research finds that, if warming is limited to 2C, 8% of vertebrates, 18% of insects and 16% of plants could lose at least half of their current range by 2100. However, if warming is limited to 1.5C, this risk is halved for vertebrates and plants, and cut by two-thirds for insects. The charts below show how future global warming is expected to affect the ranges of invertebrates (A), vertebrates (B) and plants (C) , and also a further breakdown of how warming could affect insects (D), mammals (E) and birds (F). The x-axis shows temperature rise above pre-industrial levels, while the y-axis shows the proportion of species expected to lose more than half of their range. The results show how invertebrates (A), such as insects, spiders and worms, are expected to lose a larger proportion of their range than vertebrates (B), such as mammals, birds and reptiles. Green Hairstreak Butterfly perched on a fern, Devon Coast, UK. Credit: Steve Bloom Images/Alamy Stock Photo. For mammals (E) and birds (F), risks remain low at 1.5C but grow significantly larger as warming increases, the research finds. Mammals most at risk include critically endangered species such as the black rhino, which also faces significant challenges from habitat loss and poaching. The maps below show how different levels of warming could affect global species diversity for vertebrates. The charts show the proportion of species expected to remain by 2100 – from 90-100% remaining (blue) down to just 0-10% of species remaining (red) – with and without the impact of dispersal. The maps reveal that, if future global warming reaches 3.2-4.5C, striking biodiversity loss could occur in some of the world’s wildlife hotspots, including southern Africa and the Amazon – which is home to 30% of the world’s species. 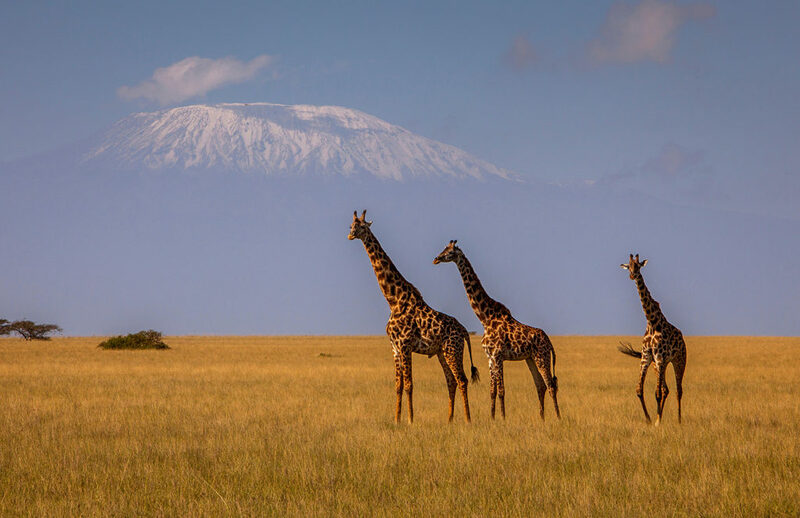 Giraffe in front of Mount Kilimanjaro, Chyulu Hills National Park, Kenya. Credit: Lucas Vallecillos/Alamy Stock Photo. Other regions expected to suffer species losses include Australia, the last remaining habitat of marsupials, and the high Arctic, home of the polar bear, the Arctic fox and caribou. This difficulty lies in the assumption that “negative emissions technologies” will be able to help the world meet the 1.5C target, the researchers say. Most scenarios envisaging how the world could limit warming 1.5C incorporate a negative emissions technology known as bioenergy with carbon capture and storage (BECCS). Put simply, BECCS involves burning biomass – such as trees and crops – to generate energy and then capturing the resulting CO2 emissions before they are released into the air. The technology has yet to be demonstrated on a commercial basis, and recent research shows its potential may be more limited than previously thought. Even if BECCS is developed on a wide scale, the researchers say, it could pose a significant threat to biodiversity. That is because large scale BECCS could require up to 18% of the land surface to be converted to biomass plantations, they say, which would drive up competition for land. Wildlife | August 8. 2018. Wildlife | July 7. 2018. Wildlife | March 3. 2019. Wildlife | June 6. 2018. Wildlife | October 10. 2012.